A while ago there was a little pop-up cafe in the council run shop space on Hoe Street. 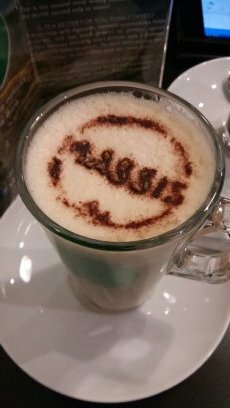 It was called Massis tea and they did lovely tea-lattes. Not very flashy, but functional. The inside is smart and kept simple. No shabby chic for a change. They have a few bits of decor and lots of identical retro looking radios. We actually have been twice and each time the staff were friendly, especially the older ‘mum’ lady who even gave us a hug the second time! The food is nice, and reasonably priced. My partner is very taken with the french onion soup. I’ve had a baked potato and a ciabatta; neither thrilling, but nice. However what I do love is the Massis chai-lattes. And they make a little logo on top! I’ve had the ginger bread and vanilla versions and they are lovely. Like having dessert and tea together. We also had lovely cake, procured from the local bakers Aura Rosa. The biscuits are from another local bakery, Crumbs. And some of their bread is produced in Walthamstow too. I love how they try and be invested in the local economy. There is also free wifi. Always a winner. 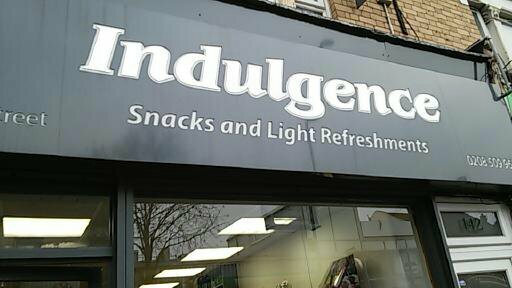 Indulgence seems to be popular with parents and I suspect it had taken the niche formerly inhabited by Daisys before it went glum. And the better news is they hope to open on a Sunday when they can get staff to cover it! So yet another ‘late’ review, redeemed by the fact that it is made up from two visits! Now returning to a venue makes it sound like I couldn’t wait to get back. Frankly it was my partner’s decision as I was taking her for a cheer-up lunch after a rough day and she really liked it the first time we went. Not that I dislike it. It’s just another corporate, chain restaurant. The decor is ‘shabby chic’ meant to look like some West Indian beach bar but from the newness of the fittings there is clearly no actual upcycling going on. 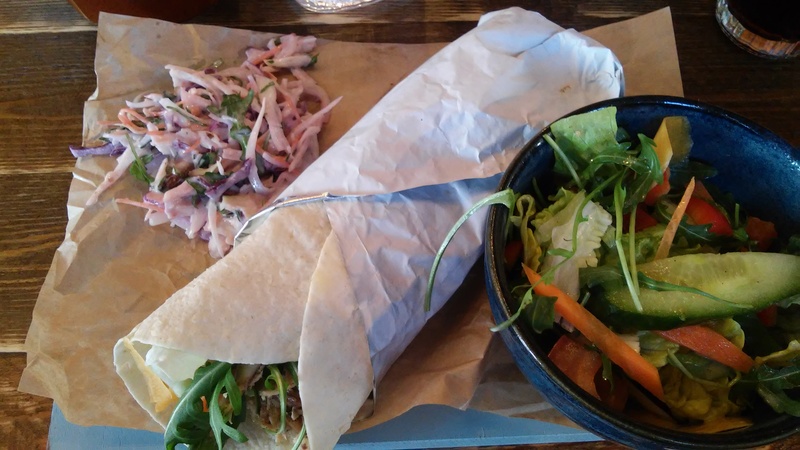 Both times I had the jerk chicken wrap. The meat was very tasty and the sweet potato fries I had on the second visit are nice. The salad I tried the first time was plain and undressed. My partner enjoys the 1/4 chicken. The first time I was boring and had a coke but her coffee came in a glass mug with a wee bottle of milk. However we next tried the interesting options; the ginger ale which was very tasty and the passion fruit smoothie was amazing (I actually had two!). The first time we let ourselves get upsold to a side order of fried plantain. It was chewey and bland. A dish to avoid. There are nice touches. Actual cloth napkins raise the tone and the staff were very friendly. There is also free wifi. While it won’t rate as a reguler place for me I think it will be a success. Our second visit was a Thursday lunchtime and it was nearly full. Walking past Pizza Express and Nandos after showed them to be nearly empty. 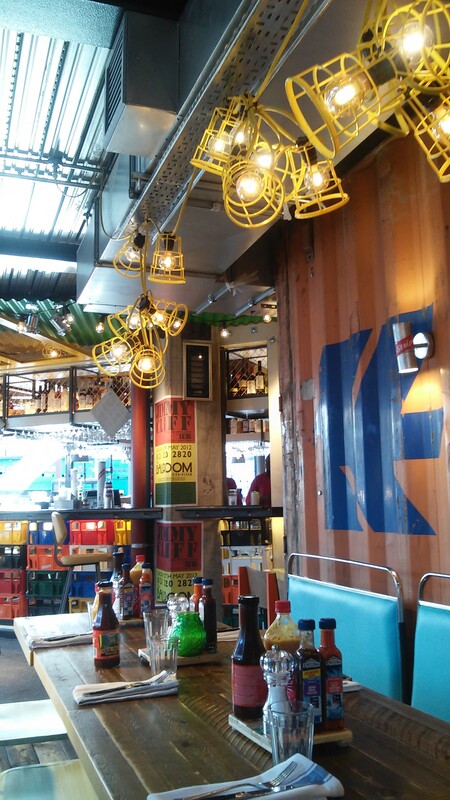 I think Turtle Bay will be a populer place for many people. So after a hospital appointment at Whipps Cross I took my partner to Nandos in the new bunker retail complex at the top of the high street. Short review: It’s a Nandos. Like all the others. Long Review: so we have been saying for many years that a Nandos would be a perfect fit for the high street. With all the crappy fried chicken places and our wonderful multicultural mix it would pick up the area. Sadly I think it has now arrived to the party a bit too late and will now help make that end of the high street into mini-Stratford (see what I did there?). Anyway, it was okay. Frankly for the £20 two lunch mains and 2 drinks cost us we could have had a nicer meal in a small independant eaterie. My other half likes the chain so we may end up back there but frankly I’d rather support the smaller places with more personality.